NEW ORLEANS – This weekend starts the NCAA Division III Cross Country “late season” in which teams can start to accumulate points needed to gain at-large consideration for the NCAA Division III Cross Country Championships in November. That means there are about to be some changes to the NCAA Division III Regional Rankings – more so than what transpired in Week 2. Those rankings were released Tuesday by the U.S. Track & Field and Cross Country Coaches Association (USTFCCCA) and upheaval was seen in eight of the 16 combined regions (if you combine the men’s and women’s lists). For those who don’t know or need a refresher, the USTFCCCA Regional Rankings are determined subjectively by a single member coach in each of the eight regions. The regional representative is tasked with weighing teams’ returning strength with current season results (if applicable) in determining team finishing order at the upcoming NCAA Division III Regional Cross Country Championship, which will be held around the nation on November 11. Nothing changed in the top-5 of either the men’s or women’s rankings. The men’s rankings sees SUNY Geneseo on top once again, followed by RPI, TCNJ, Rowan and SUNY Oneonta. Like their counterparts, the SUNY Geneseo women sit No. 1. The Knights are tailed by Ithaca, RPI, St. Lawrence and Rochester (N.Y.). Loras, St. Olaf and Wartburg are No. 1, No. 2 and No. 3, respectively, for the second week in a row. Behind the Knights sits Carleton, up one spot from No. 5 last week. Carleton’s jumped forced Nebraska Wesleyan down to No. 5. Carleton’s women soared from No. 3 to No. 1 thanks to a strong effort at the St. Olaf Invitational. The Knights had an 87-second spread between its top runner and fifth runner and should shrink that as their young team gets more 6Ks under its belt. St. Olaf dropped from No. 1 to No. 2, St. Thomas (Minn.) went from No. 2 to No. 3 and Wartburg and Nebraska Wesleyan remain No. 4 and No. 5. The men’s rankings were almost flipped on their head as only top-ranked Calvin remained in place from Week 1. Otterbein is now No. 2 after winning its home invitational, one week after capturing the win at Ohio Wesleyan. John Carroll moved up to No. 3 from No. 6 as it won the Tiffleberg Open with a score of 57 points despite two of its top runners not racing. Trine took the weekend off, yet went from No. 5 to No. 4 and Mount Union finished runner-up to John Carroll at the Tiffleberg Open and vaulted from No. 8 to No. 5. Calvin, Hope and Kenyon are No. 1, No. 2 and No. 4, respectively. Last week’s No. 5 (Oberlin) and No. 3 (Otterbein) swapped spots. The Yeowomen topped both Kenyon and Otterbein at the Otterbein Invitational. The top-5 in the men’s rankings is still the same as it was one week ago: Johns Hopkins is No. 1, followed by Haverford, Carnegie Mellon, Dickinson and Elizabethtown. The Johns Hopkins women are also No. 1 and had an incredible showing at the Paddy Doyle Meet of Champions where they won the team title. Dickinson is No. 2, Elizabethtown sits No. 3, Haverford is No. 4 and Carnegie Mellon climbed from No. 8 to No. 5. North Central (Ill.)’s men won’t budge from its No. 1 ranking until someone makes them. The same could be said for No. 2 UW-La Crosse, No. 3 UW-Eau Claire, No. 4 Washington (Mo.) and No. 5 UW-Stevens Point. The women’s top-5 dug in deep as Washington (Mo.) is still No. 1, Chicago is still No. 2, followed by UW-La Crosse, UW-Eau Claire and St. Norbert. Zero changes befell the men’s rankings as Williams, MIT, Amherst, Middlebury and Bates are still placed in order No. 1 through No. 5. Over in the women’s rankings, MIT, Williams and Middlebury hold down the top-3 spots while Bates and Tufts swapped spots from last week. 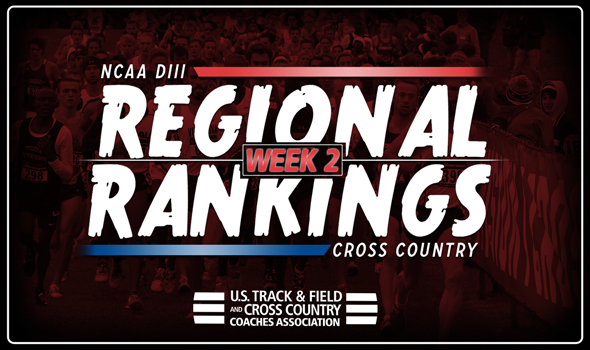 For the second week in a row Christopher Newport’s men headline this region with Emory, Rhodes, Washington and Lee and Trinity (Texas) close behind. Change occurred in the women’s rankings but not up top, where Emory and Rhodes are. Instead, Trinity (Texas) climbed from No. 5 to No. 3, Centre went from No. 6 to No. 4 and Lynchburg comes in at No. 5. The top teams in the men’s rankings squared off this past weekend at the UC-Riverside Invitational and the way they finished show how they’re billed. Pomona-Pitzer comes in at No. 1 once again after a convincing win over both new No. 2 Claremont-Mudd-Scripps and new No. 3 Occidental. Willamette and Lewis and Clark come in at No. 4 and No. 5. The women’s rankings are topped by Claremont-Mudd-Scripps and Whitworth. The Athenas witness Bryn McKillop run the 10th fastest NCAA DIII time on the course at the UC-Riverside Invitational. Next up behind those two teams is Pomona-Pitzer, Occidental and Linfield.